The Weeping Mother Memorial, sometimes called the Grieving Mother, commemorates those who have who died in service or were killed in action in the various conflicts in which Australia has been involved. It was originally erected to commemorate those who died in service or were killed in action in World War One. Made of Ulam marble, the memorial features a weeping mother atop four pillars. She holds a scroll reading "Their name liveth for evermore". The pillar sits on a base of two steps and is partially covered with a tasselled shroud. It bears the leaded names of the 68 local men who fell in World War One. The names of those from later conflicts are recorded on the base of the pillar including two killed in the Vietnam War. On either side of the path leading to the Weeping Mother are stones carrying a plaque noting the history of an original light now housed at the Gatton and District Historical Society and an Australia Remembers 1939-1945 plaque. The memorial was originally erected by public subscription to commemorate the soldiers of the district who fell in World War One. The foundation stone for the memorial was laid by The Honourable L.E.Groom, Federal Attorney General on the 22nd April 1922. He said that the memorial was an expression of sympathy with the mothers of fallen soldiers. 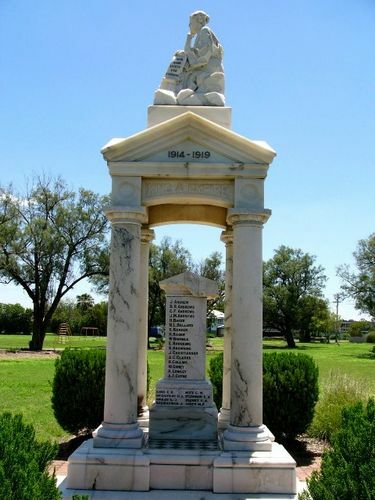 The memorial was unveiled by the Governor of Queensland, Sir Matthew Nathan, on the 14th November 1922. Queensland Times, 25th April 1922, The Brisbane Courier, 16th November 1922.